What is a Lung Transplantation? Lung transplant, or pulmonary transplantation is a surgical procedure in which a Patient’s diseased lungs are partially or totally replaced by lungs which come from a donor. While lung transplants carry certain associated risks, they can also extend life expectancy and enhance the quality of life for end-stage pulmonary Patients. What happens during Lung- transplantation? How long will my loved one stay in Intensive Care? What happens during lung transplantation? While the surgical details will depend on the type of transplant, many steps are common to all these procedures. Prior to operating on the recipient, the transplant surgeon inspects the donor lung(s) for signs of damage or disease. If the lung or lungs are approved, then the recipient is connected to an IV line and various monitoring equipment, including pulse oximetry. The Patient will be given general anesthesia, and a machine(Ventilators (Breathing Machines) will breathe for him or her. In a single-lung transplant the process starts out after the donor lung has been inspected and the decision to accept the donor lung for the Patient has been made. An incision is generally made from under the shoulder blade around the chest, ending near the sternum. An alternate method involves an incision under the breastbone.In the case of a singular lung transplant the lung is collapsed, the blood vessels in the lung tied off, and the lung removed at the bronchial tube. The donor lung is placed, the blood vessels reattached, and the lung re-inflated. To make sure the lung is satisfactory and to clear any remaining blood and mucus in the new lung a Bronchoscopy will be performed. When the surgeons are satisfied with the performance of the lung the chest incision will be closed. A double-lung transplant, also known as a bilateral transplant, can be executed either sequentially, en bloc, or simultaneously. Sequential is more common than en bloc.This is effectively like having two separate single-lung transplants done. The transplantation process starts after the donor lungs are inspected and the decision to transplant has been made. An incision is then made from under the Patient’s armpit, around to the sternum, and then back towards the other armpit; this is known as a clamshell incision. In the case of a sequential transplant the recipients lung with the poorest lung functions is collapsed, the blood vessels tied off, and cut at the corresponding bronchi. The new lung is then placed and the blood vessels reattached. To make sure the lung is satisfactory before transplanting the other a Bronchoscopy is performed. When the surgeons are satisfied with the performance of the new lung, surgery on the second lung will proceed. In 10% to 20% of double-lung transplants the Patient is hooked up to a heart-lung machine which pumps blood for the body and supplies fresh oxygen. After Lung Transplantation your loved one is admitted to the Intensive Care Unit. Use of a Pulmonary Artery Catheters or a PICCO catheter to closely monitor cardiac function is not uncommon. If you are visiting your loved one in the Intensive Care Unit at this stage you should expect to see many lines, tubes, and drains attached to your loved one. Immunosuppression remains the mainstay of therapy for successful outcomes after lung transplantation. The need for optimal immunosuppression became evident to maintain long-term survival and to navigate the delicate balance between infection and rejection. Cytomegalovirus (CMV) is a very common virus. About 70 percent of adults have been exposed to CMV at some time. It usually causes a flu-like illness with fever, body aches, and decreased appetite for two or three days. After exposure to the CMV virus, antibodies form in your blood to protect you from future exposures to CMV. This is similar to what happens after you have chickenpox. Because of the immunosuppressant medications, your loved one will be at risk for CMV infection after transplant. During the first few months, while the immunosuppressant doses are highest and your immune system is especially weak, the CMV virus can reactivate or “wake up”. Blood tests are performed to check both the transplant recipient and donor for the presence of CMV antibodies. 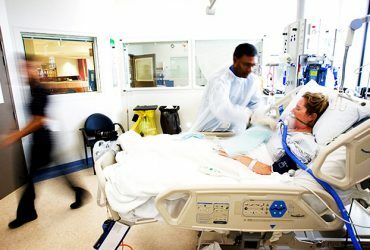 The length of stay in Intensive Care after Lung-Transplantation ranges from 1 or two days after an uncomplicated and straight forward procedure and recovery, up to many weeks and sometimes many months in Intensive Care, especially if your loved one requires mechanical ventilation with Ventilators (Breathing Machines) and with Tracheostomy. My sister has been in ICU for 21 weeks with Tracheostomy and still ventilated.What do we need to do?